The Myanmar Snub-nosed Monkey (Rhinopithecus striker) was discovered to science in 2010, in a remote area of northern Myanmar; the species was identified through a dead specimen collected from a hunter. 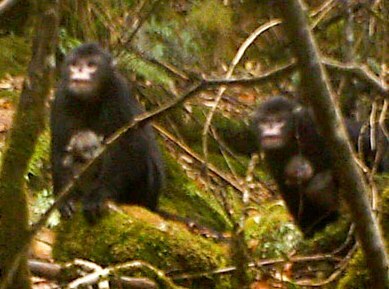 In 2011, after years of not recording any live populations in the wild, PRCF and partners took a first camera-trap image of a small group of monkeys. The Myanmar Snub-nosed Monkey is very rare and considered critically endangered. They are named after their small and upturned noses, which makes them sneeze when it rains and therefore easily found by hunters. Estimates are of between 260-330 individuals of this species, which continue to face increasing threats to their population and habitat. Myanmar snub-nosed monkeys are hunted and sold for medicinal use of their bones and their fur. Habitat loss due to infrastructure development and commercial logging also threaten the survival of this species. PRCF Myanmar does not yet have a project targeting conservation of this species and its habitat.